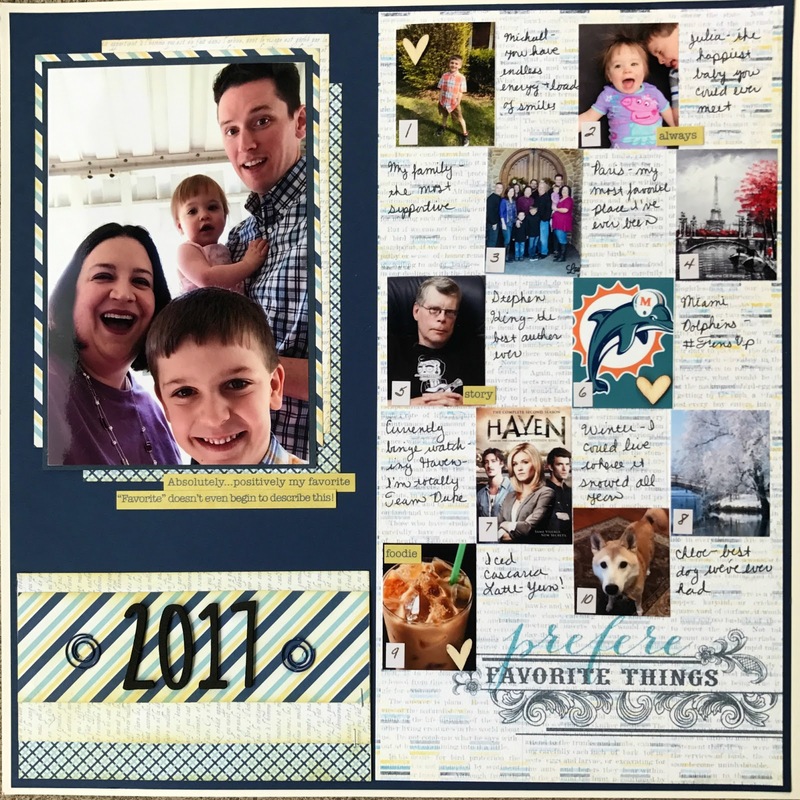 Welcome back craft friends as I share another scrapbook layout with you. I created this layout as part of the scrapping party over at the Secret Not Secret Kit Club Facebook page. There was a sketch created by Eileen that we were able to interpret to our liking. I stuck pretty close to the sketch except for my embellishments. Since I used a camping collection for this layout the embellishments didn’t match my theme so I had to make my own. I used punches, inked the shapes and added some doodles to make them interesting. 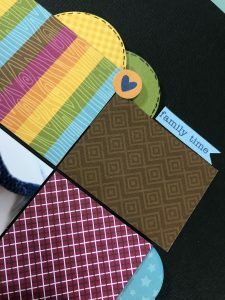 The other items are small stickers from a totally different collection that was family themed, but matched the color scheme of the papers. I really enjoyed this sketch because it lent itself to using a 6×6 paper pad. As with most people I have way to many, and use them way to much. It felt good to get some of it used. I previously used this collection to make a cookout invitation that you can see here. I originally started this layout on white cardstock, and I kept looking at it and not liking how it was coming out. Additionally, I tried outlining, more doodles, etc and nothing helped. Once I pulled everything up and tried a black background…wow…did it look so much better. The bright colors just popped in a way they didn’t on the white. Don’t be afraid to try a dark background when something just doesn’t seem to be going the way you like. Thank you for joining me today, and reading about each project I created. I love hearing your feedback and I’d love to see any projects you create as a result. The Paper Addict is a participant in the Amazon Services LLC Associates Program, and Scrapbook.com, affiliate advertising program designed to provide a means for me to earn fees by linking to Amazon.com and affiliated sites. Hey Scrappy Friends! 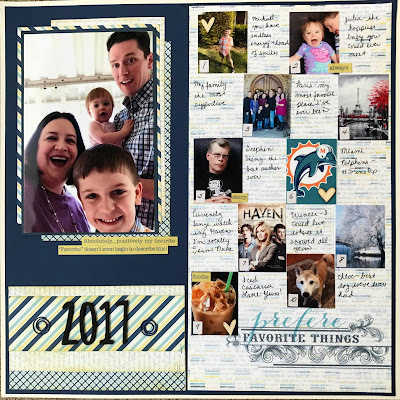 I’m back today sharing another layout for the Use Your Stuff challenge blog. 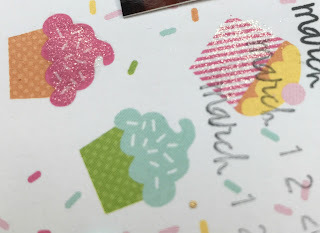 Our challenge this week was to make a metallic or sparkle layout. 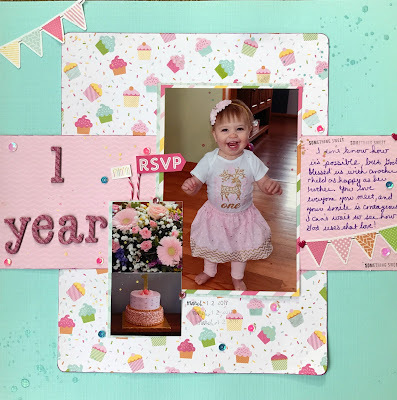 What better way to use sparkle than on baby J’s first birthday pictures. I started with a sketch I found on PageMaps. it gave me the perfect base for what I wanted to include. The large photos of obviously of J in her birthday outfit. The two smaller photos are the cake her auntie made her and the flower we used to decorate inside of paper decorations. The aqua cardstock base is from an old DCWV pack that I wish they still made. I’ve been hoarding the last bits. 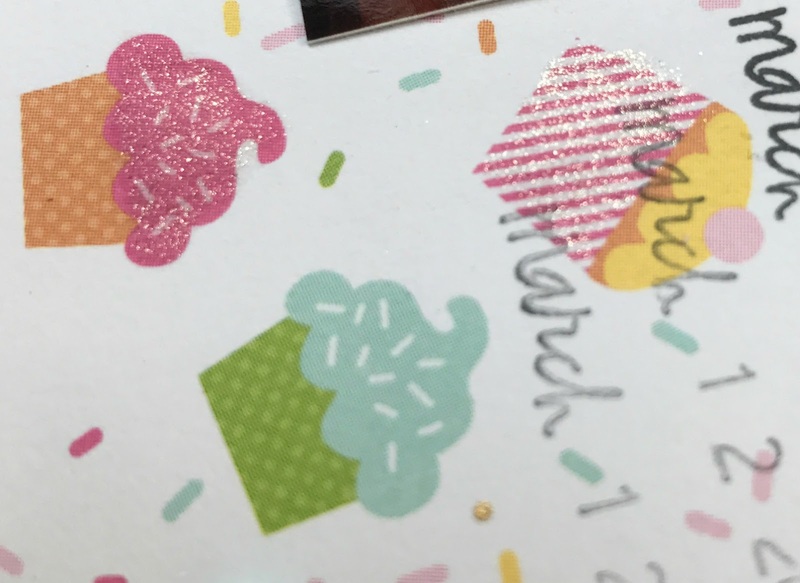 The patterned paper is Echo Park Birthday Wishes. To make it metallic though I “painted” some of there cupcakes with Wink Of Stella in Clear and Light Green. I also added a splash of sequins around the page, and a glitter chipboard title. To finish it off I used glitter pens from Kaiser Craft and some Heidi Swapp Color Shine. I was really pleased with how this came out…it’s one of those photos that you have such high hopes for because it’s so special, and it’s just perfect. I hope you love what I’ve created, and as always…leave me a link with what you created and I’ll be sure to comment. 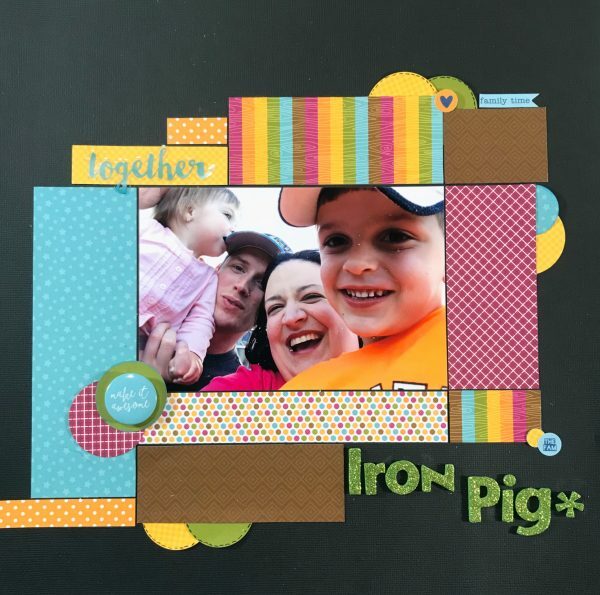 Happy National Scrapbook Day Scrappy Friends! I have the distinct honor of running one of the challenges for this weekend over on the Victoria Marie Facebook Group. The challenge I came up with was to create a project with your top ten current favorite things. As per usual I started with a sketch…This one was from Creative Scrapper Volume Three. The sketch had a huge amount of journalling on the right side, and I thought that was a great place for my top ten. The paper on the right in from the Authentique collection all Favorite and was perfect for this theme. The numbers and tiny word stickers are also from Authentique. I didn’t care for the photo on the other pieces from the collection though so I pulled out a 6×6 pad from My Minds Eye called Moments. The scrappy challenge of this was though that it was white and the Authentique is cream. Tim Holtz distress pads in Antique Linen to the rescue. If you’re not a member of the Victoria Marie group I hope that you’ll consider joining for loads more inspiration and new scrappy friends. 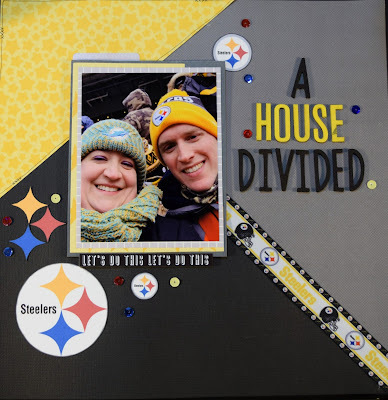 So if you were to come to our home on any given Sunday you’d see me heartily routing for the Miami Dolphins and hubby trying to find the Steelers on a channel we get. This year the two teams happens to play each other in the Wild Card game in Pittsburgh, which is about five hours from us. We asked my sister and brother-in-law to watch the kiddos for us that Sunday so we could watch the game in piece. The readily agreed, but we got a call a few hours later and they said…why don’t we watch them all day and you guys can go the game! So…I’ve had this photo of us at the game since then waiting for the perfect sketch or challenge. That came this week in the form of a sketch from Clique Kits and a challenge from Challenge Yourself. For Challenge Yourself I needed to use negative space, which I think I did well in the upper left and lower right. For my title I used a combination of thickers (my favorite Amy Tan ones) and wood veneer. I painted the wood veneer with an acrylic paint I received in a Studio Calico kit YEARS ago. This did remind me why I don’t buy wood veneer alphabets anymore though…only one E in the whole thing! For the embellishments I printed a series of logos using the print and cut feature on my Silhouette Cameo. I then inked the edges to make them stand out just a bit as the white edge was just seemed to get lost even though the background was black. 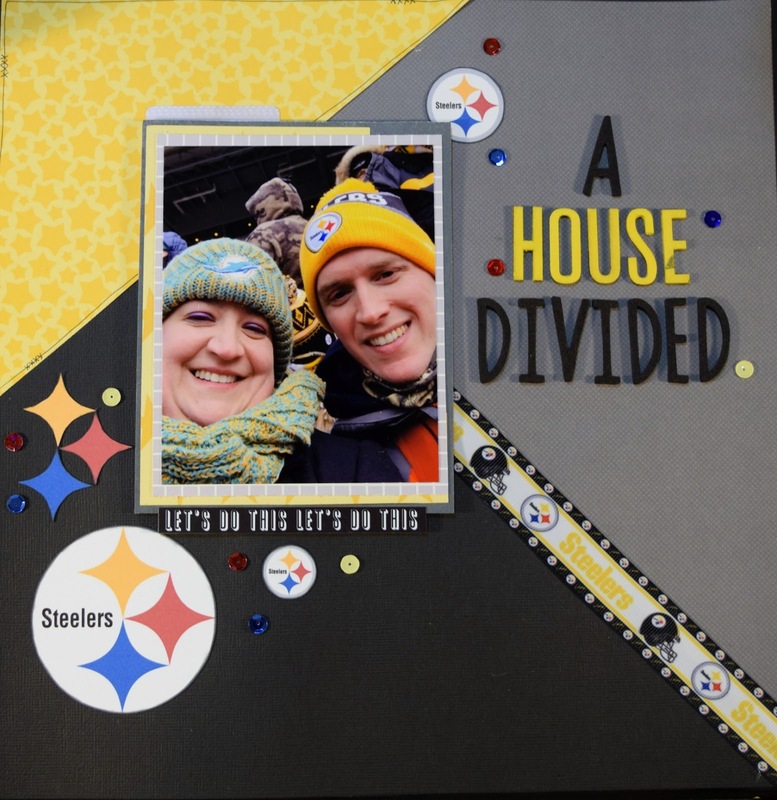 I added some matching sequins and some Steelers ribbon I’ve had in my stash for ages, and called it complete. I felt like adding anything more would have been just to much. Thanks so much for checking my layout out, and you never know…if you stay tuned you may see the same photo done for the dolphins side! I am pleased to share this video with you! I was able to collaborate with a bunch of other artists (not just paper crafters either) showing projects inspired by the new live action Beauty and the Beast. Come check out my twisted take and check out what all the other talented people made!